White Paper Abstract: In the face of rising healthcare costs and increasing accountability for population health and quality outcomes, a growing number of healthcare organizations are recruiting health coaches to facilitate actionable, sustainable health behavior change in rising and high-risk populations, across a continuum of delivery platforms. The percentage of healthcare organizations with a health coaching program increased from 70 percent in 2016 to 81 percent in 2018, according to the latest Health Coaching Survey by the Healthcare Intelligence Network (HIN). Chronic care management, weight management/physical activity and tobacco use are the leading health conditions targeted by health coaching initiatives. A growing number of healthcare organizations are also targeting social determinants of health as part of their health coaching program. 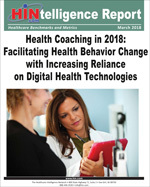 Download this HINtelligence report for more data on the use of technology in health coaching, metrics for evaluating health coaching effectiveness, the leading modality for health coaching and much, much more.